I'm not sure on your budget, but the fidelio x2 are also pretty good bass heavier headphones. looking for a new headphone, i want to replace my inears at home for health reasons. there is the HD598 and the HD650 that are on sale. I need them for games and electronic music, i would also prefer to be able to use them directly on the PC. Also, i have to wear glasses, ive had bad experiences with non inear in the past. is the HD 598 good enough? does anyone here have any experience with AKG K92 or 52? I'm thinking about buying K92, but a lot of reviews say that K52 are surprisingly good so i'm not sure if it's worth to invest into K92. Speaking of K92, does anyone also have experience with using them with mobile phones (currently i have samsung s4 mini, but i plan on upgrading to oneplus 3T or oneplus 4 - depending on the money situation). Another thing i'm interested in is how much the sound bleed? To be more precise, i do not live alone and there's always somebody in the same room with me so i'm wondering how much loud are they/ the person in the same room will be able to hear what i'm listening to. I plan on using them for music/games in my room, but also for travelling somewhere/to work (despite ugly gold colour). And on a completely unrelated note, does anyone have experience with Speed Link SPES clip-on microphone? How much of background noise does it pick up (interested for the aformentioned reasons). If you don't sin Jesus died for nothing. Personally I'm using an Audio-Technica ATH-R70x, most amazing pair of headphones I've ever used (especially in its price category). I wear glasses btw and they never get in the way. I bought some Foxtek THX00's during one of the drops at the end of last year and they're really nice! 10/10 would buy again. Took an artsy photo of them sitting on my Snowball next to my Majestouch. Anybody knows Mixcder? The headphone Mixcder offers are very cost-effective. Does anyone have any recommendations for a portable DAC/AMP that can power cans with 300 Ohm impedance? as portable. Which of these would be best suited for such a task? I'm likely going to buy Aune X1s for use with my PC but I still spend a lot of my time commuting between places via train, so something portable would be nice to go with BeyerDynamic DT 1770 PROs. I need to replace my Bose qc20, as it doesn't work anymore. I have to use IEM, as having something above my head makes me have massive neckproblems (dunno why). Any recommendations for a budget for around 5-700$? I wanna just go with bose again, but it seems they got some good competition now. Wireless is also an option, I like the wireless necklace. Sony wf 1000X is something I'm considering. A little bit of music. I do not want a flat bass like I feel some sennheiser headsets have given me. For future reference the Philips Fidelio X2's have really good earpads/cushions (by default) which don't stress your glasses too much and fit quite well. Quite happy with mine, comfortable for sure. I'm a complete novice when it comes to headphone/audio gear. 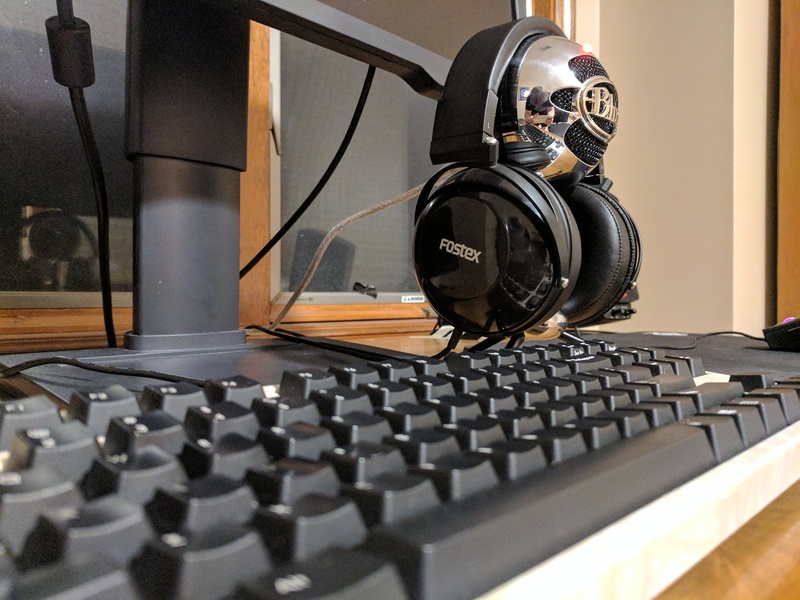 I just bought a HD650 from massdrop, any advice on an amplifier? Budget is around $200, to be used with a desktop PC only. The schiit fulla 2 is only $100 and would suit your needs fine. Im looking to buy a wireless headset but I have 0 experience buying any at all. Does anyone have any recommendations at the $150-$200 (USD) price point and at the $200-$300? I'll likely wait until Black Friday but I have no idea on which ones to keep an eye on. From what I was able to look around places that seemed reliable it sounds like the Steelseries Siberia 800s are good but idk for sure. To my question: I want to know if there are open/closed headphonesthat can be converted to a closed/open one for traveling / commute / work. I am currently use a Sennheiser PC360 when I am on my PC, which is an open headset with great sound and very comfortable and would like something similar. When traveling / commute I currently use some Inears which are ok, but the cable starts to die. I also dont like to be fully sealed off when walking through the city because of safety reasons so I only wear one Inear at a time. An open headset would allow me to enjoy stereo while still being able to hear my surroundigns well enough. Problem with open headphones is they are not suiteable for the train because people that listen to loud music on the train, especially on the morning commute have forfeit the social contract and should be strangled with their headphones they dont use.I dont want to carry around 2 pairs of headphones though. Pretty much the same goes for being at work. Since my Inears are starting to die it would be a good opportunity to replace them and I already looked around a bit but without any success. Does anyone know about some open headphones that maybe come with some sort of noise canceling backplates that you could use to close of the outer part of the speakers? In terms of price range anything goes up to 200€ if nececary, though I am propably more eyeballing aroud the 90-150€ range since it seems more reasonable.